To ask other readers questions about The Culture Code, please sign up. Which cultural traits match where you are now? This is a nonfiction book that explores how groups succeed achieving their goals. It describes the characteristics of successful groups in different fields including sports teams and corporate environments. I learned new insights on what makes people genuinely engage in organizational goals. I recommend the book to anybody in management positions or people that have to work in groups or teams. This book is phenomenal! Who knew that reading a book about groups of people would be so interesting?? From chapter one I was immediately hooked. I learned so much and found myself engrossed in the stories about how the Navy Seals became such an incredible group, how PIXAR has churned out so many of my favorite movies and about how for one Christmas during wartime both sides called a truce and stopped fighting. This is just the tip of the iceberg too. There are a ton of stories about business le This book is phenomenal! Who knew that reading a book about groups of people would be so interesting?? From chapter one I was immediately hooked. I learned so much and found myself engrossed in the stories about how the Navy Seals became such an incredible group, how PIXAR has churned out so many of my favorite movies and about how for one Christmas during wartime both sides called a truce and stopped fighting. This is just the tip of the iceberg too. There are a ton of stories about business leaders, professional athletic coaches and more. Plus there aren’t only good examples of team work and leadership, there are examples of terrible groups with devastating outcomes. This book is full of facts yet is never boring even in the slightest. I learned how to be more effective while working with a team and how to be a leader who leads with compassion and vulnerability in order to be successful in my office place as well as in life. Great book! I highly recommend it to anyone really. Even if you don’t work in an environment where team work occurs, this book is applicable to every day life and real life situations. 5 Stars! I was lucky enough to get a copy of this as an ARC from NetGalley - and devoured it! I'm fascinated by the subjects of leadership and teams these days, mostly because I have experienced great team leadership in the past but too infrequently. After enjoying "Turn This Ship Around" -- this seemed like a great follow-on. In the first chapter, the author describes an experiment in teamwork and collaboration -- conducted between two different groups: kindergarteners and college students. The goal was I was lucky enough to get a copy of this as an ARC from NetGalley - and devoured it! In the first chapter, the author describes an experiment in teamwork and collaboration -- conducted between two different groups: kindergarteners and college students. The goal was to build the highest tower with straws and marshmallows. The kindergarteners WON because they were entirely focused on the outcome, made changes and took feedback without being distracted by status management. That's something we all learn as we unlearn trust and vulnerability. The book presents compelling case studies to support three sets of skills for building strong teams. First, you have to "Build Safety" -- create environments where it is ok to provide feedback regardless of status or role. Second, "Share Vulnerability" - describes how "habits of mutual risk drive trusting cooparation." Third, "Establish Purpose" -- by creating a shared culture that clearly defines the group's purpose, goals and how they do things. Much like the mythical "work" of a romantic relationship or marriage, the author maintains that "Culture is a set of living relationships working toward a shared goal." When is the last time that you were part of a group where you had that kind of experience? Would you ever want to leave that environment? He then describes "belonging cues" which are "behaviors that create safe connection in groups." This is basic NLP stuff combined with basic etiquette: taking turns, body language, vocal pitch, eye contact. These help signal energy, individualization and future orientation. These are all translated as "You are safe here" by the brain. Just a few of these, once in a while, is not enough -- "We are built to require lots of signaling, over and over. This is why a sense of belonging is easy to destroy and hard to build." Coyne also dives into the neuroscience that has been on my radar for much of 2018 -- and emphasizes that the amygdala is not just about perceiving threats but also plays "a vital role in building social connections." Those "belonging cues" are all transformed in your brain to help "set the stage for meaningful engagement." The WWI "Christmas Truce" is one of the cases in this section -- and it's come up in popular media in my life several times this year alone. Basically - you throw a bunch of guys into very adverse conditions, and you find that creating environments that are rich in social belonging cues is critical to their survival and cooperation. However, as the battle dragged on -- this spilled over to "the enemy" -- and soldiers established "micro-truces" around meal times, bed time, using the latrine or picking up the dead, cumulating in a series of Christmas day truces across a pretty widespread geographic area. Respect the power of the amygdala! By way of contract, another type of culture that is the opposite of belonging is described -- it was designed to break up cohesion and resulted in very poor work performance from otherwise very smart people in charge of massively destructive and dangerous weapons. You'd think people would pay attention to something as important as culture, right? Coyne also addresses a popular conception that highly successful cultures are happy places: "They are energized and engaged, but at their core their members are oriented less around achieving happiness than around solving hard problems together." This goes back to "this is a safe place (to give effort" -- creating connection, giving feedback, and communicating the big picture are important. But with the negative (say, giving feedback on poor performance) there is reward (belonging). During the Cold War era, an MIT professor named Thomas Allen conducted research into what attributes were shared by successful projects. In addition to the projects being driven by “clusters of high communicators,” Allen found that the most successful teams sat close to each other and could establish eye contact with each other regularly. Many studies since have demonstrated the importance of physical proximity – the informal interactions among colleagues are critical to building relationships that foster trust. In the past several years, it seems like this has resulted in a lot of companies tearing up their office environments to turn them into "open plan" work spaces without figuring out what works best for their teams. Not all teams are alike, and one size does not fit all when it comes to building strong teams. Overdo Thank-Yous - that includes "thanks for letting me coach you" - as a way of affirming the relationship and "igniting cooperative behavior." Embrace Fun - "it's the most fundamental sign of safety and connection." In sharing vulnerability -- teams can demonstrate their willingness to accept the help and support of others in a way that makes the entire team stronger. The case study of two pilots and a passenger who happened to be a flight instructor crash landing a plane together -- resulting in the survival of 185 of 285 on board. Simulations run after the event failed to do nearly well as those three people -- resulting in crashes 28 times. Coyne analyzes the content of their communication and finds that they shared information in a way that was humble and allowed them to perform in the face of catastrophic systems failure (it's a fantastic story!). Coyne then goes on to analyze the importance of social exchanges in the team environment -- the kind that open up shared vulnerability in a way that creates a "shared exchange of openness" that forms "the most basic building block of cooperation and trust." The DARPA Red Balloon Challenge is another fantastic case study about how people can cooperate when vulnerability is shared and support invited in a way that is reciprocal and offers mutual benefit. That is, he points out - the whole point of groups: "combine our strengths and skills in a complementary way." The Navy SEALs examples are fantastic -- and you have to buy the book so you can read and understand them. I especially like the description of how the SEALs were established -- and the type of training they undergo to reinforce team behavior. They learn how to move together, trust each other and figure things out as they go because they trust each other and they understand how things have to be done. He also goes into the rules around a complicated improv exercise with a successful comedy troupe where "Every rule directs you either to tamp down selfish instincts that might make you the center of attention, or to serve your fellow actors (support, save, trust, listen)." Coyne also talks about the importance of overcoming authority bias to create successful groups -- "having one person tell others how to do things is not a reliable way to make good decisions." This is fascinating because it goes back to the premise of "Turn This Ship Around" where the goal was to make everyone in the team a leader -- creating a team of leaders who understand the problems that need to be solved and work together without regard for role or hierarchy is important for these successful groups. The chapter on "The Nyquist Method" is fascinating -- it's named after a particularly nurturing engineer who created a safe space for his coworkers to share ideas and sparked ideas with them that resulted in greater achievements than if they had worked on their own. He then reviews other folks who perform similar catalyst roles in other environments - people who mostly just are good active listeners, encouraging others to dig deep and shape the solutions to their challenges. Again, NLP plays a role here - or "concordances" - body language that helps increase perceived empathy and in turn creates a safe environment for stronger teams and success. Coyne is good about reiterating and building on the tips for creating these safe environments and strong relationships throughout his book. Primarily - listening, being willing to be open and vulnerable, using objective techniques for sharing information (like "Before-Action Review" or "After Action Review"). Taking us back to the previous point about successful cultures aren't always sunshine and rainbows -- "one of the most difficult things about creating habits of vulnerability is that it requires a group to endure two discomforts: emotional pain and a sense of inefficiency." Finally, the section on "Establish Purpose" is really fun to read -- as he goes to lengths to repeat, a lot of the slogans and catch phrases seem hokey or corny or obvious but the fact is that teams who create compelling, clear goals and articulate them like that are described as "high purpose environments" because they know what they are doing as a team. These catchphrases establish a link between a goal or behavior and "consistently create engagement around it." He also talks about how positive feedback can create a "virtuous spiral" of success (and no need to mention how the opposite happens as well!). These kind of heuristics "provide guidance by creating if/then scenarios in a vivid, meorable way" and function "as a conceptual beacon." These kinds of clearly articulated catch phrases make it easier to make decisions in support of specific team goals, such as "You can't prevent mistakes but you can solve problems graciously" or "If someone is rude make a charitable assumption." Little practical insight beyond what's obvious. I'm surprised by high ratings here. An experiment was run where entrepreneurs presented ideas to a group of angel investors. Tracking just the social cues exchanged by presenter and audience predicted the rankings by the investors with nearly perfect accuracy. So the content of pitch didn’t matter as much as the set of cues during the presentation. However, when investors just evaluated the plans on paper, they ended up ranking them very differently. It makes you wonder what the difference would be in angel funding (especially for female entrepreneurs) if plans were only evaluated on paper? Amazon is famous for not allowing Powerpoint presentations and just having everyone in the room read a narrative doc first before discussion—this effectively minimizes the risk of people accidentally evaluating an idea based on social cues. I loved the simplicity of the Red Balloon Challenge! A $40,000 prize was offered to the first group to accurately locate 10 balloons which would be placed across America on the same day. Competing teams built tools to try and track them, analyze photography, set up communities of searches on social media. etc. Most of the time, the groups said that they would share the money but they limited the number of people who could participate as they didn't want the money to be expanded over too many people. A team from MIT Media Lab built a website and invited people to join. “We’re giving $2,000 per balloon to the first person to send us the correct coordinates, but that’s not all—we’re also giving $1,000 to the person who invited them. Then we’re giving $500 [to] whoever invited the inviter, and $250 to whoever invited them, and so on…” Organizers believed it would take a week for a team to find all the balloons. The MIT team did it in under 9 hours. With the help of 4,665 people. This one makes me so sad for the human potential that we must be squandering. In an experiment, at the beginning of the school year, teachers were given names of children who have “unusual potential for intellectual growth.” (Students were not told about this.) At the end of year, these high-potentials students had indeed succeeded to a remarkable degree. They were also described by teachers are being more curious, happier, better adjusted, and more likely to experience success as adults. Teachers reported they had enjoyed teaching more that year than any other year. But the reality was the students were selected at random. Because teachers believed the story about them, they taught them with more warmth, feedback, called on them more often, etc. So the students responded to this. And teachers were more likely to give them the benefit of the doubt if they did something wrong. 1) Build Security. "As far as our brain is concerned, if our social system rejects us, we could die." Subconsciously, we're all assessing a multitude of signals that convey whether we belong. A strong culture sets up an environment where a team can deal with uncomfortable truth-telling and be candid with each other. This section had a lot of really interesting information about the set of small behaviors that can have a large impact on creating a strong culture. 2) Share Vulnerability. When people make themselves vulnerable by sharing information about themselves, they build connections and trigger that it's same for others to do the same. Having leaders be open that they don't know all the answers makes it possible for everyone on the team to contribute and step up. 3) Establish Purpose. A study of 200 tech start-ups in Silicon Valley in the 1990s found three basic models: star model (hire the brightest people), professional model (build the group around specific skill sets), and commitment model (developing a group with shared values and strong emotional bonds). The commitment model led to higher rates of success and achieved IPOs three times more often. Interesting stories and pretty useful advice. Some of the same successes touted by all the business books (Pixar, Google, SEALS), but some new ones too (Daniel Meyers restaurants and pilots). It's fairly obvious that we need belonging cues, but I think sometimes we forget that even in board rooms and business settings, we are still primates who would die for friends and kill enemies. This was a really great introduction to creating successful group dynamics. If you are new to the world of peer leadership and fostering inclusive working environments, or if you just need a refresher, this is the book for you. If you are looking for something a bit deeper I may skip to something else! Overall a quick read with some hi-lightable moments. One of the best business and psychology books I've ever read. Yes, it's full of old ideas and talked about topics, yet it is urgent and relevant as ever, nonetheless. Mr. Coyle does a great job with this book. Everyone from normal people living their daily lives like me to management and Jeff Bezos can find something useful in this book. In fact, Mr. Bezos would probably outline many of the steps and advice in this book as to how he built Amazon to the successful empire that it is today and still growing. As I was reading this book I could see practical ways that my employer could apply these principles better; especially in meetings and coming together for a Mr. Coyle does a great job with this book. Everyone from normal people living their daily lives like me to management and Jeff Bezos can find something useful in this book. In fact, Mr. Bezos would probably outline many of the steps and advice in this book as to how he built Amazon to the successful empire that it is today and still growing. As I was reading this book I could see practical ways that my employer could apply these principles better; especially in meetings and coming together for a common goal. Now is the best time as there are many projects starting. The book starts out with an experiment involving business students, kindergartners, lawyers, and CEOs. Every time the kindergartners won. This is because they did no worry about who was the leader but worked energetically together with short communications to achieve the goal. This is just one of the examples of a successful group. Not to say that no leader is better but working together with clear communication is key. Also, having really good employees that can be trained is worth a lot. 1. Build a safe environment. Everyone must feel a sense of belonging and safe to participate. This gets at some basic anthropological in-group vs. out-group dynamics. There was also a bit of discussion that boiled down to the fact that people will respond better when you express empathy towards them. Also a bit of discussion about non-verbal cues, which I feel is something lost in the virtual working world. 2. Share vulnerability. I personally feel this goes hand in had with the safe environment concept. It speaks to the fact that group leaders may not always know what's best, and that's ok. Having that tacit agreement makes it possible and encourages others to contribute to solving a problem. Absolutely LOVED this book! Dan Coyle does an amazing job of showing the converging validity of behaviors of the Highest Performing organizations. Organized broadly as psychological safety, vulnerability, and purpose (communication and alignment), it was fascinating to see how leaders and organizations made this happen, across a wide spectrum of organizations. I was intrigued by the variety of ways that organizations and leaders create safety and trust - in general, it was by social interactions, Absolutely LOVED this book! Dan Coyle does an amazing job of showing the converging validity of behaviors of the Highest Performing organizations. I was intrigued by the variety of ways that organizations and leaders create safety and trust - in general, it was by social interactions, where leaders and teammates genuinely cared for everyone on their team. They created this trust by humor, personal interactions, and the attributes most commonly associated with close family and friends. The biggest take aways I had were in the variety of ways that leaders communicated their purpose, and the variety of examples that show how important it is for leaders to over communicate. I loved the example of leaders asked what percentage of their company will correctly answer the companies top priorities -- guesses were ~60% -- reality was 2-3%. This was one of the best business / behavioral psychology books I've read in a long time! The examples were incredibly engaging, and drew from a variety of industries to make their points. As I read, I kept getting new ideas for things I could change on my own team to improve results. Highly recommend this book to anyone who leads a team! My main gripe with the book overall is simply its length. I could have learned just as much with half the stories. Часто грущу от бизнес книг написанных журналистами. Истина у них редко будет мешать созданию хорошей истории. Ну и за все хорошее и против всего плохого. Why do some teams and organizations excel while others simply aren't as creative/effective/lasting? It isn't skills or intelligence, but the environment in which they work. Coyle conveys the research and shining examples of how creating a sense of true belonging, allowing for vulnerability, conveying a clear purpose, and more, creates the right space. Yes in a sense these things are old news, but Coyle gets into the specifics of what each means, with concrete actions leaders can take to recreate Why do some teams and organizations excel while others simply aren't as creative/effective/lasting? It isn't skills or intelligence, but the environment in which they work. Coyle conveys the research and shining examples of how creating a sense of true belonging, allowing for vulnerability, conveying a clear purpose, and more, creates the right space. Yes in a sense these things are old news, but Coyle gets into the specifics of what each means, with concrete actions leaders can take to recreate the conditions in their own environments. Further, the rationale is given in motivating ways. I only wish that more of the examples were fresh, rather than familiar ones like Johnson and Johnson and Navy SEALs. "Do I belong?" "Are we safe?" "Do we have a future together?" These aren't questions posed by early humans reaching out to build a community that will eventually trust and nurture its members. Answering "yes" to these questions indicates a high-performing team. Because teamwork is essentially about building a common micro-culture with ties that bind. I haven't come across a business book that puts a lump in my throat. But this one did because it is full of stories that exude warmth, belonging, and "Do I belong?" "Are we safe?" "Do we have a future together?" A lot of business books use examples that are not varied enough or only highlight one industry. The author does a terrific job choosing illustrative examples of great teams from an incredibly broad array of industries. The public sector is left out, unfortunately, but otherwise it's great. The concepts of safety, vulnerability, and purpose really resonated with me. Overall, it's a very enjoyable read - never dry - and sticks to its core framework. Easy to understand. I would definitely recommend A lot of business books use examples that are not varied enough or only highlight one industry. The author does a terrific job choosing illustrative examples of great teams from an incredibly broad array of industries. The public sector is left out, unfortunately, but otherwise it's great. The concepts of safety, vulnerability, and purpose really resonated with me. Leaders need to create a positive environment where people feel comfortable if they are wrong or fail. Not that failure is good. This starts at the top by the leader admitting vulnerability and owning mistakes. It also finds that one bad apple really can spoil the bunch unless they are handled with TLC. I have been in organizations that are the negative example and the positive so I fel the author is right on these thing. Like Navy SEALs say there are no bad teams just bad leaders. 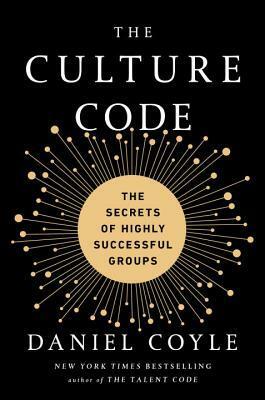 The Culture Code deciphers the secrets of highly successful groups like SEALS, Team Six, IDEO, San Antonio Spurs, Pixar, etc. Daniel Coyle presents the argument that to achieve such successful behaviour you have to work 3 different skills that complement each other and that together result in team performance at the highest level. The book, naturally, is organized in three main chapters in which the author explores one skill at a time, presenting his theory and giving lots and lots of real examp The Culture Code deciphers the secrets of highly successful groups like SEALS, Team Six, IDEO, San Antonio Spurs, Pixar, etc. Daniel Coyle presents the argument that to achieve such successful behaviour you have to work 3 different skills that complement each other and that together result in team performance at the highest level. The book, naturally, is organized in three main chapters in which the author explores one skill at a time, presenting his theory and giving lots and lots of real examples. These real-life stories, narratives and examples of these amazing groups are what makes this book so amazing for me. Daniel got to know and depict the inner workings of the teams, meet their leaders and talk to them about their role in leading the team members. It was fascinating to read about how these people think about obstacles, problems, vulnerability and empathy. I was super enthusiastic throughout the entire reading and I'm sad that the book ending, because it was extremely motivating to be exposed to those behaviours and attitudes. The language of this book is super easy to follow and Daniel makes it feel like this could be a light reading. It is, truly, but there's also so many things you should reflect about. This book is extremely important in the sense that it compels you to question how your actions in everyday life impact the team you work with. In fact, this book is not only for people who lead companies or even who lead teams inside companies. Yes, if you're a leader you'll absolutely find this book interesting and useful. However, this book is a good read for other people - it makes you more conscious of your attitudes towards the many groups you are part of in different areas of life and it will surely bring to the fore some aspects you might feel need work and, of course, working on them can make you a better professional but, most importantly, a different person altogether. I'm super excited to put Coyle's theories to work and experience a growth in performance and instill new behaviours. "The Culture Code" seeks to unearth the secret behind a quintessential question that has been a quandary spanning geographies, time spans and intellects - "Why are some Groups more efficient than the rest?". In this book, the best selling author of "The Talent Code" attempts to unravel the mystery and makes a commendable fist of it. Relying on scientific, meticulous and measurable research and results, Daniel Coyle goes into the very core of what makes a team click. Citing a range of examples fro "The Culture Code" seeks to unearth the secret behind a quintessential question that has been a quandary spanning geographies, time spans and intellects - "Why are some Groups more efficient than the rest?". In this book, the best selling author of "The Talent Code" attempts to unravel the mystery and makes a commendable fist of it. Relying on scientific, meticulous and measurable research and results, Daniel Coyle goes into the very core of what makes a team click. Citing a range of examples from the seemingly ill-organised but powerfully cohesive team spirit coursing through the acts of a group of kindergarten kids to the practices followed within the locker room of The All Blacks, Coyle demonstrates that every team can aspire to succeed and succeed in a big way. Pretty nice read, reminds me of Michael Gladwell's work in a way. Lots of interesting stories and examples, as well as useful insights for culture design and change. Love Coyle's courage to attempt to dissect and explain something as complex as culture. I don't feel he made it, but he definitely did a good step in that direction. This was the right book for the right time. I had been thinking about what makes a good culture in an organization, and this book showed up in a friend’s living room. It’s a quick read but it’s worth rereading. My highlights were definitely made for future reference. If you’re responsible for a group that needs to work together, this is a good book to read. Looks interesting. It'll be a while before I get to read it though. I passed it to my husband, who is studying team building and behaviors. Jā, jā, jā!! Nosaukt vārdā, lai piešķirtu spēku. Nosaukt vārdā, lai skaidrāks skats. Nosaukt vārdā, lai dotu iespēju piedzīvot skaisto, radošo, nebijušo. Trāpīgi un iedvesmojoši. Easy to digest ideas about how to build and nurture a success team or group. Includes lots of examples and anecdotes about successful groups including Navy Seals, San Antonio Spurs and Pixar. Completely changed my thinking on what makes groups successful. Full of great information, ideas and examples.